Use a vegetable peeler or sharp knife to peel outside layer of squash. *If you don’t have a peeler, use a knife and get as much skin off as you can without cutting off too much flesh (yours or the squash's). Add all ingredients in the slow cooker. 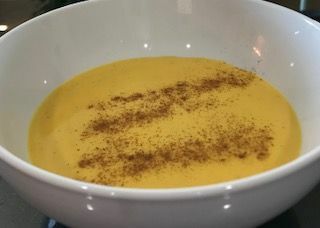 Once cooked, transfer 1/2 the soup to a blender and blend until smooth. Make sure you take the plastic top off the blender cover to let the heat escape if the mixture is very hot. You don’t want the top to pop off! Optional garnish: a spoonful of Greek yogurt with a sprinkle of cinnamon on top.